One of my favorite things to do in Georgia [or anywhere, really] is explore it's many historic small towns. Madison is one of the more well-known historic cities in Georgia, famous for being spared by General William T. Sherman during his Civil War "March to the Sea" where he captured and destroyed numerous Confederate cities. Today, Madison includes one of the largest historic districts in the State of Georgia and nearly 100 Antebellum homes, many of which have been carefully restored by previous and current owners. Twice a year, in partnership with the Historical Society and/or the Madison-Morgan Cultural Center, many of these owners graciously open their doors to the public for tours. 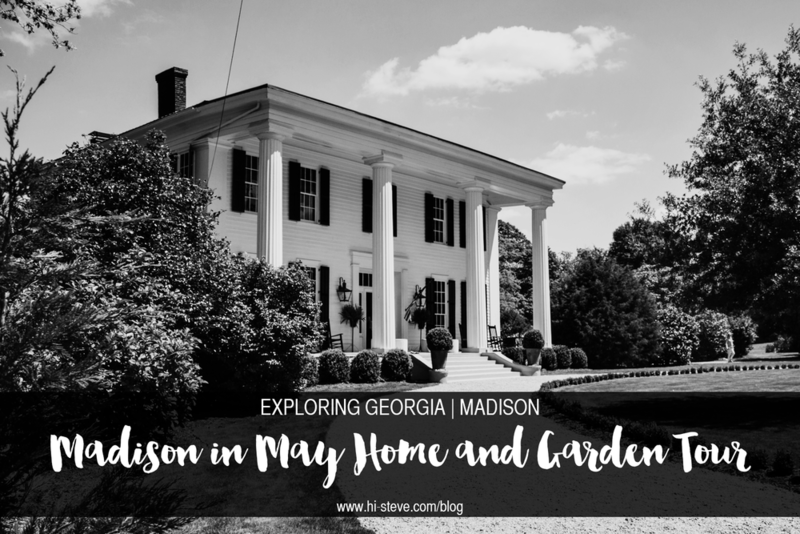 This past weekend, the annual Madison in May Spring Tour of Homes and Gardens was held and since it also happened to be my momma's birthday, we made the short drive down to Morgan County for a day of "ooo-ing and awe-ing" over the beautiful estates. Since this is possibly my most picture-heavy post to date, I'll try to keep my yakking to a minimum and just let you enjoy the photos- Which were a challenge to capture as the home tours are one of Madison's most popular attractions and there were PEOPLE EVERYWHERE. So, my apologies for any random arms and torsos you may see along the way. I also want to note that while photography was welcomed for the exteriors of all the homes, there were a few owners who asked that visitors refrain from taking photos inside- Disappointing, yet completely understandable. But, I'll let you get to it- Hope you enjoy! I almost died in this kitchen... Hammered copper farmhouse sink, painted brick backsplash, exposed beams and shiplap ceiling, heart pine floors, french doors leading to the gardens... OOOF. 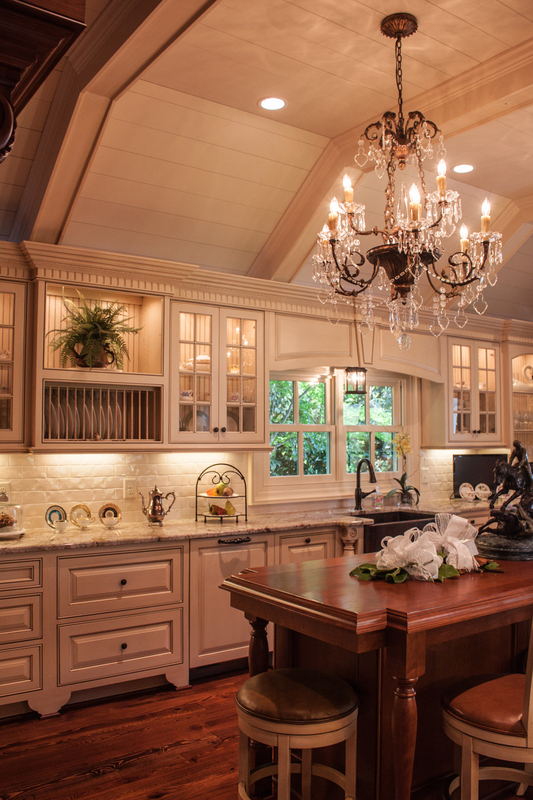 I could never keep a kitchen like this clean, but boy it sure would be fun to try! It probably looks gorgeous when it's messy, too. Is it a door? Is it a window? YES! It's a windoor... or a doordow. I believe it was formerly a floor-to-ceiling window that originally lead to a porch and was converted to a door when the addition was built, which was behind me as I took this photo. Also note, behind the chair, is a "window" to the inside walls of the home where you can see the original brick and lumber support system. So clever! The chandelier in the dining room originally called the White House home... Yes, THAT White House. Ya know. NO BIG DEAL. 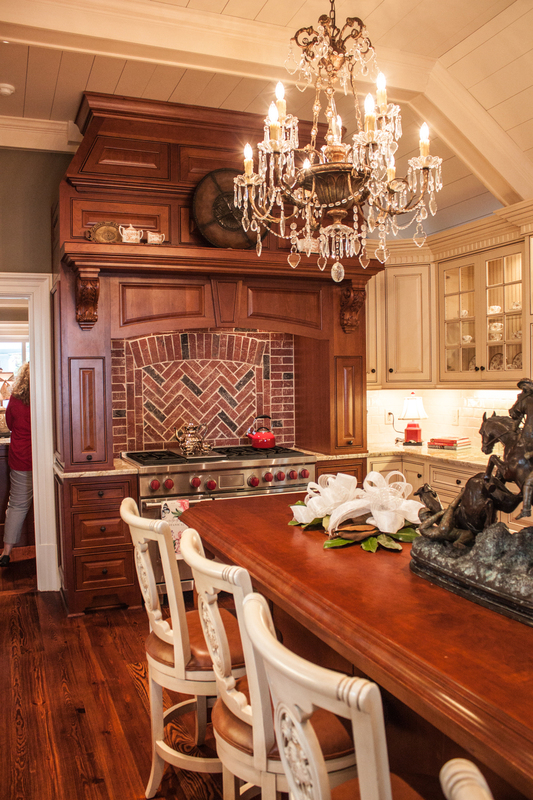 Give me all the brick in all the kitchens. Hubba, hubba. I REALLY wish we would have been allowed to take photos of this Federal style reproduction. It's basically my dream house. A new house, that looks old and it was filled with BOOKS. This was the last home we toured and I somehow forgot to take photos inside. Or maybe we weren't permitted? I don't remember. 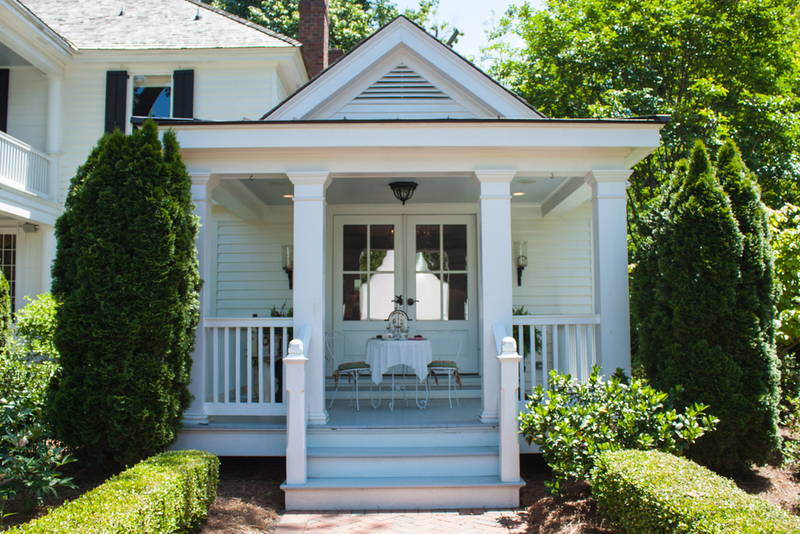 Either way, this recently renovated estate is featured in the May 2015 issue of Atlanta Homes & Lifestyle Magazine so you can find more info on the home's history and multiple interior photos OVER THERE. 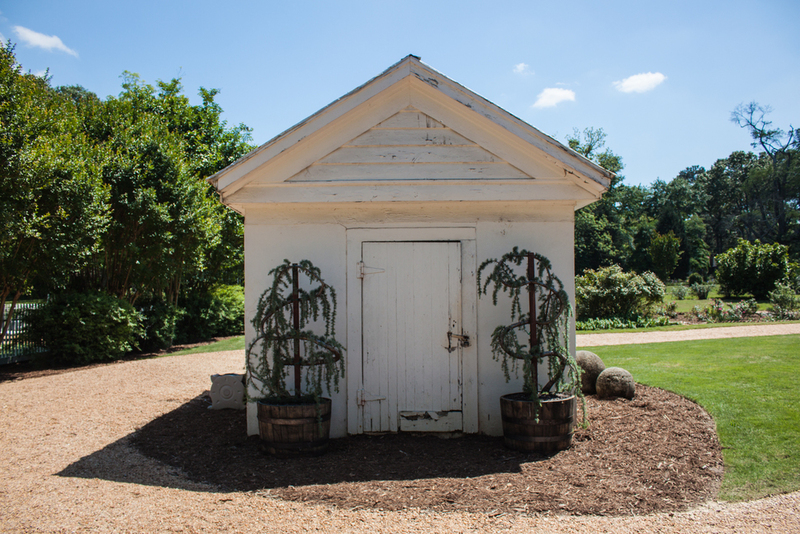 The current owners are doing a wonderful job of preserving and repurposing many of the old outbuildings that are original to the property. The homes below were actually not included on the tour, but they were worthy of a few photos anyways! Every time I visit Madison, I say I'm going to spend a day here just walking around taking photos... These are all right on Main Street, but there are many more if you venture deeper into the side streets. And my personal favorite, the Foster-Thomason-Miller House, which is also for sale. Again. Oh, the things I could do with a few spare million dollars! They have a fantastic website for this building, full of info on it's rich history, CLICK HERE to visit.